HCN receives a James Beard Award, and says hello to one of Paonia’s newest and smallest residents. Here in Paonia, Colorado, where High Country News is headquartered, the town is busily preparing for the upcoming summer season. Seasonal stores are reopening, including the local ice cream shop, much to the delight of staffers who can now walk less than half a block to satisfy their cravings. To burn off the double scoops, we have 70-degree temperatures — perfect for a bike ride to the (mostly) still-blooming orchards. Our readers are out enjoying the warm weather, too, taking advantage of the spring season to hit the road. Subscribers Dale and Peter Korba visited the office on the back end of a six-week trip to the Southwest and Southern California from their home in Boulder, Colorado. One of their favorite places was Kartchner Caverns State Park in Arizona. Dale said she was happy to see that some of the national parks they visited have begun to place a greater emphasis on the history of the local Indigenous people. Longtime readers Bob and Cathy Lefevre, a retired librarian, visited from Sand Creek, Wisconsin, on their post-retirement tour through the Southwest, thereby knocking a few things off their bucket list. For Bob, that meant hiking up and down the Grand Canyon in a single day! 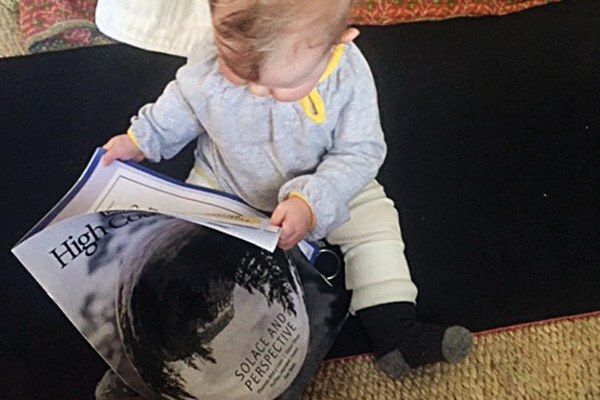 An astute reader enjoys her mom’s new subscription to High Country News. In other HCN news, one of our Alaska-based contributors, Julia O’Malley, won a prestigious James Beard Award in the “Foodways” category for her HCN story, “The Teenage Whaler’s Tale.” The story, which followed one boy’s whale hunt, and the social media vitriol that followed it, helped readers understand the importance of subsistence hunting for Native Alaskan villages. In June, HCN will be participating in a joint presentation, Environmental Justice in the Great Basin, alongside the Progressive Leadership Alliance of Nevada. The panel will address the key issues and battles over the last 40 years as they relate to military and nuclear development and the impacts to rural and native communities, among other topics. Executive Director Paul Larmer is moderating the panel. The talk takes place on June 8 at 6:30 p.m. at the Crowley Student Union Theater (1664 N. Virginia St., Reno, Nevada) and is free and open to the public. New reader Kate Linehan, from Paonia, says the whole family is enjoying her subscription, including daughter Thryn (pictured), who is absorbing the news in more than one way. Kate and her mother, Mona, recently opened Creature Collective on Grand Avenue, a store dedicated to ecologically sustainable products, from natural plant-dyed clothing to bedding plants for the garden. Finally, we have some corrections to make. From our feature “Cashing in on Standing Rock” (HCN, 4/16/18), we incorrectly reported that Michael Wood came to Bismarck, North Dakota, from Baltimore, Maryland. He arrived from Los Angeles. In the story “What to do with an extra billion or two?” (HCN, 4/30/18) we incorrectly identified New Mexico Sen. Tom Udall as chair of the Senate Committee on Indian Affairs. He is the vice chair.